Thunderbird: There was an error saving the message to Draft. Retry? Changed the local folder in the account settings > server settings in Thunderbird to point to the newly created above folder. 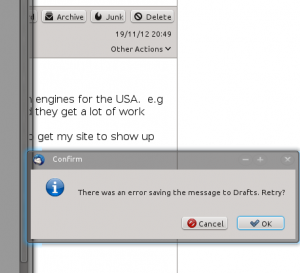 Restarting Thunderbird made the problem go away. Finally! Just added a new Plugin on this Blog to enable me to be more creative. I am still experiencing with it. I am glad to see that one of the biggest issues with CMS systems is still their level of complexity. This is not a problem for things that you’re using all the time like Smart phones (well how much do you actually know about the phone you’re using? Do you know for example it’s got a feature allowing you to make phone calls). It’s more like when you tend to not do it often and you’re not an Internet Guru, let alone a PC wiz kid. For most people having or managing a website is not necessarily something they do on a full time basis. like the chairman of a Club or a charity or a one man business. That is my target market. My website design site provides an unique design plus the ability to edit the pages easily and fast without having to hold a degree in Computing Science. My clients only contact me when they need technical assistance, it works because it is KISS. This CMS system is quite good I must say, (the one that I used to create this content. ), it is relatively simple, the strategy is working great especially the Plug-In system, although I must say that I struggle, it’s getting too complicated for me already. Now the reason, finally, of my excitement is that when you are using WordPress you tend get a lot of spam messages (well this site does). I am happy to announce that on this front there’s been a development, with the use of a Plug-in called Spam-stopper which is the easiest one ever. I have yet to receive a single spam comments 🙂 or any comments at all for that matter. As I went to get some fruit from my local Supermarket, I decided to take a look at their Country of origin, the Bananas where from Colombia, the Apples from Brazil the Corn on the Cob from Portugal and a salad from Morocco. There were no British Fruit, This is hardly promoting local Producers. It is amazing that despite the transport cost, it still make sense to have most cheap products imported from half way across the World than help the economy by buying and producing British. But ah, there’s a problem, buy British and face a sensible increase in price. Yet the economy is on its knees, no-ones buying local produce and no-one’s getting paid …Once in the hole…. I recently bought very cheap (and very good when Barbecued) Lamb steaks, coming from New Zealand, dear Lord! My regular Bacon is from Denmark thank God(! ), not too far off then. I buy British, sorry, Scottish Chicken*, which is less than half what you’d be expected to pay for a similar one in Switzerland (yet the price of milk is about the same). I decided to get my Free range eggs from a local Neighbour like I used to do a couple of months ago, the eggs are really good and they charge £1.50 for half a dozen. Try you get “as good as” Eggs in a shop at that price since January this year. But the plans is really to get my own Hens and have my very own Free Range Eggs in the not too distant future. I think I will start to grow my own, again… We should all do. At least we’d have more money for Fuel. Now how much is recycled plastic sheeting? *And very good too with Roasted Potatoes (which are also Scottish phew). The situation on planet Earth, especially Europe. I have been pondering about Europe, Syria, Scottish independence and I think that there’s a lot of stuff I learn through the media and always think, based on that, what do I think about all this? Well, Europe’s at a crossing point, the future is “apparently” bleak and the UK Government has taken “contingency” plans to prevent influx of non longer European migrant from Greece and other possible countries likely to break up from the Eurozone. That’s all media reporting. Europe is at a critical point but it’s not really sunken in that everyone’s into it: We’re still paying for the mistake of the past, Banks like the England’s one still trying to pump money into the economy to try to keep a system afloat that is controlled by mathematicians tweaking their computer program algorithms to extract every single bit of profit from the “hunt”. Yet that’s exactly what’s happening at the moment. Europe as we know it is doomed, there’s a lot to contend about the Greek government, yes I hear that people in Greece try all to avoid paying tax if they can. The Greek people are amongst the people that work the most hours in Europe. These people make the economy what it is. Their transactional policy is cash, probably more than it is elsewhere in the EU. it’s not hard to confirm that the Greeks are simply using cash more than other, still they work hard for their money and the price of everything is well known to them for sure, more than can be said about people in any other EU countries, it’s not a secret that Tax is not really coming into the equation with cash. So can they be all lazy? come on! Think about it, they still need to function, they’re people like us, living a life like us, they’ve just been profiting from the boom as well as we all did, however they’ve not been too lucky and, what would it be if it wasn’t the job of the Government to make sure it didn’t happen? When I see the head of Government of Greece he doesn’t look like he’s been depriving himself has he? The guy can barely move in the hot Greek weather so unfit and fat he looks. That one of the problem; European bureaucracy has brought so much red tape, subsidiaries and other help, yes to make it easier to trade on the wider area that is Europe, but at what cost? visibly a ruinous one. Let’s not kid ourself, it’s a time to start to see that the system is wrong and needs to be corrected. The German people, again show that they’ve got it sorted, it’s a bit like Europe is only Germany at the present time, to be able to bail so much money to other, at VERY high risk is showing real community spirit, almost like communism. Syria’s a nightmare, It’s not Libya, there’s a lot of affinity with the West for many aspect not least Israel. A hot pot of pro American policy and yet people are massacred in their very own streets? Where does the blame lies? The Government, the rebels? I am unsure. The neighbouring Liban is starting to become unstable again, it’s worrying.The UK Prime Minister must know something that we don’t when he recently commented about the “dreadful regime” in Syria (Hein? Quoi?). Also Iran not being far away, can only add more fuel to the fire, Egypt’s also moving toward People elected Government, I say Bravo, a country where people decided to take their destiny in their own hands. I am not Scottish, so I can’t decide. I think it’s risky, very risky, it can pay off in a big way with Scotland becoming able to use the Euro currency to trade with the rest of Europe. But hang on, the European system, with its single currency is no longer, well not presently, a viable route, so what are the Scots going to use for currency, the £ Sterling? If the people of Scotland (that’s interesting to see what the Greek people are going to decide about staying in Europe, apparently most of them are willing to.) decide to indeed go independent, I say go on, however somehow I think, that it would be wise to look into past similar experiments for lessons to learn. As a Swiss Citizen, I am however able to say that us Swiss, have been independent for 721 years, we’ve build a nation of high working with high core values. (I have read references as “mildly repressive”, give me a break!) people that take work as a passion with high rewards, Switzerland is one of the wealthiest nation on earth and it’s one of the tiniest as well, (Hey Scotland take note) . Ok, ok, I hear you say “the second World War, the Nazi Gold, the Bank secrecy…” Are we to blame for doing a good job at everything that we do? Is it our fault if people in other parts of the World (rightfully) see this a a safe place with lots of advantages (the fiscal one being a prime example). Sorry for just being too good at minding our own business(es) when it comes to minding others. Switzerland’s a unique World experiment where everything is “propre en ordre” (clean and in order) where everything is just the way and what it should be. The people decide for everything if enough of them feel like it is worth deciding in the first place, it is called Direct Democracy, sorry wrong link: here it is Direct Democracy. So when it comes to all this, I think that Europe, like Communism, Capitalism and whatever else is a very good idea really, but it’s not really working in practice. Man has always been driven by survival, survival of the fittest. Somehow there’s a strange connotation with what we’ve been, we are and will be experiencing in the inexorable advance of that elusive particle, time. As far as 1996, some Analyst thought that the idea of Europe and the single currency was a good idea in theory, but in practice, as Europe was becoming less industrial, the idea was out of date, that is why Germany is very good for the European system, others like the Greeks aren’t. So let’s rework this coherently. Besides I am also looking forward to what’s going to happen with that French President? I will not be surprised if he falls flat on his face (désolé Monsieur Hollande, pardon, Mr le Président, rien de personnel). Posted on 26/05/2012 14/06/2012 Categories RantTags bail out, banks, capitalism, communism, debt, democracy, direct, disintegration, egypt, ethics, euro, europe, finance, germany, government, greece, libya, money, repressive, switzerland, syria, tax, usa, work, world2 Comments on The situation on planet Earth, especially Europe. I am beginning to wonder if this wind turbine mania is going to be a regrettable experiment in years to come. I am currently located in an area where they seem to be sprouting like mushrooms. I am all in favour of natural progression of human kind and preservation of natural resources for future generations, so wind power is a good idea as such, however I am not sure that this will turn out to be such a good strategy once most of the country has more wind pylons than trees, and by the look of it it’s not going to take long. Let’s wait 20 years from now and see if the result will be like other “big investments” that turned to be detrimental in the long run. I for one think it’s going to be one of those “money spinners” that made sense at the time but turned out to be a waste of money in the end. What’s going on with the Google and the back button??? For the last few weeks, Google seems to have adopted a new way to serve search queries, it seems that they’re using some some of JQuery or AJAX within their results. each time I go back to Google (using the back button) the search query in the input field is wrong, as it’s a former search Query?? Google’s messing up with the fundamental way of web surfing, that cannot be good! It’s the end of the year / C’est la fin de l’année. Ok the TV is crap and I am bored, so I though to post something about 2011. It’s been a rubbish year, I have good hopes for 2012. With the latest about Recession and other “We are at the top of the ravine, let’s make a big step forward” News, it’s not looking good. However we have friends coming to see us soon from France, so this will be appreciated. I am also planning to go to Switzerland for a Holiday, I might also go and work there. Bon, la télé est nulle et je m’encrasse à mort, alors j’ai décidé de poster un message à propos de 2011. C’a été une année horrible. J’ai de l’espoir pour 2012, avec l’Europe, la récession et les nouvelles qui n’arrêtent pas de dire “Nous somment au bord du précipice, maintant faisons un grand pas en avant!”, c’est pas réjouissant. Malgré tout, des amis viennent nous voir de France tres bientôt, ce la me mettra de bonne souche. Je prévois aussi d’aller passer quelques jours en Suisse, même peut-être retourner travailler, qui sait.